Blindness and betrayal are Elizabeth Taylor’s great subjects, and in A View of the Harbour she turns her unsparing gaze on the emotional and sexual politics of a seedy seaside town that’s been left behind by modernity. Tory, recently divorced, depends more and more on the company of her neighbors Robert, a doctor, and Beth, a busy author of melodramatic novels. Prudence, Robert and Beth’s daughter, disapproves of the intimacy that has grown between her parents and Tory and the gossip it has awakened in their little community. 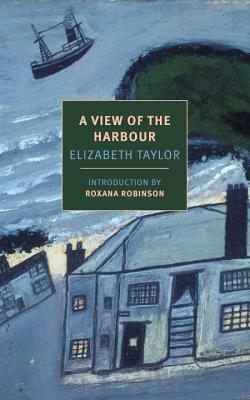 As the novel proceeds, Taylor’s view widens to take in a range of characters from bawdy, nosey Mrs. Bracey; to a widowed young proprietor of the local waxworks, Lily Wilson; to the would-be artist Bertram—while the book as a whole offers a beautifully observed and written examination of the fictions around which we construct our lives and manage our losses. Elizabeth Taylor (1912–1975) was born into a middle­-class family in Berkshire, England. She held a variety of positions, including librarian and governess, before marrying a businessman in 1936. Nine years later, her first novel, At Mrs. Lippincote’s, appeared. She would go on to publish eleven more novels, including Angel and A Game of Hide and Seek (both available as NYRB Classics), four collections of short stories (many of which originally appeared in The New Yorker, Harper’s, and other magazines), and a children’s book, Mossy Trotter, while living with her husband and two children in Buckingham­shire. Long championed by Ivy Compton­-Burnett, Barbara Pym, Robert Liddell, Kingsley Amis, and Elizabeth Jane Howard, Taylor’s novels and stories have been the basis for a number of films, including Mrs. Palfrey at the Claremont (2005), starring Joan Plowright, and François Ozon’s Angel (2007). In 2014, NYRB Classics published You’ll Enjoy It When You Get There, a selection of Taylor’s stories, edited by Margaret Drabble. Roxana Robinson is the author of eight works of fiction, including the novels Cost and Sparta. She is also the author of Georgia O’Keeffe: A Life. A Guggenheim fellow, she edited The New York Stories of Edith Wharton, published by NYRB Classics in 2007.